I’ve been counting the days until I could dig deeper into the post-apocalyptic world of Days Gone (note: it’s been 288 days). I talked Bend Studio into setting me loose in an updated build of the PS4 survival-action game due out on PS4 April 26. My hands-on time proved there’s more (much, much more) here than meets the eye. My trek through Farewell, Oregon kicked off about an hour into the game. As biker-mercenary Deacon St. John, I stepped into a deadly open world populated by flesh-eating Freakers and roving bandits. A plethora of activities awaited me: bounty hunting, clearing out Freaker nests, investigating the fate of Deacon’s wife, and settling old scores. These missions fit into threads dubbed, fittingly, “Storylines.” Storylines are Days Gone’s answer to the well-worn “quest” structures found in other open-world adventures. Tired of chasing a quest thread? Just hop to another Storyline and be on your way — the other stuff will be waiting for you when you’re good and ready. In a nice touch, you can access your Storyline progress anytime via a quick swipe across your DualShock 4’s touchpad. Bend Studios’ decision to set the game in the developer’s backyard, the US Pacific Northwest, was a wise one. The snow-capped mountains, sprawling trails, vast forests, and sand-swept high deserts are almost otherworldly in their beauty. But danger is always close. I’m a few minutes into my play session, cruising the open road. I catch a flash of movement — the telltale red flicker of a laser sight — and before I can inhale I’m knocked off my bike by a marksman hidden in a tree ahead. As Deacon climbs to his feet, a crew of hatchet-wielding bandits close in to finish the job. This was no scripted encounter, but a reminder that in Days Gone’s unpredictable world, threats can emerge in surprising ways. (postscript: I kicked their asses). Later, I’m clearing out an ambush camp, using my SMG, Molotovs, and stealth kills to methodically take out the marauders lurking within. It’s routine stuff. I wipe out the lead baddy, grab his tire iron to redeem for a reward, and start to loot the immediate surroundings. So far, so good. That’s when five, then 10, then 20, then 50 Freakers leap up directly in front of me, drawn in by the commotion. I stumble backward, blinking in disbelief as I blindly fire my SMG at the ever-growing crowd — effectively channeling every bad guy in every zombie movie moments before they’re ripped to pieces. I realize my only hope is to run for it. I sprint for my bike and have a moment to curse myself for parking it facing a wall before I’m instantly overcome by a tidal wave of snapping jaws and flailing limbs. It’s an epic ending to an otherwise routine mission. In Days Gone, there’s no such thing. Have an escape plan. You’ve got a gun, a bike, and a mission. Now all you need is a bug-out plan for when a Freaker horde descends like a swarm of locusts. Where you park your bike — and which direction it’s pointed in when you do — is often more important than your weapon loadout. And remember: your bike is your save point! A quick note on weapons. Weapons come in five different flavors, ranging from Level 1 (“Junk”) to Level 5 (“Special Forces Condition”). Days Gone gives generous and on-the-fly stat comparisons, but it won’t always pay to go for the highest DPS. 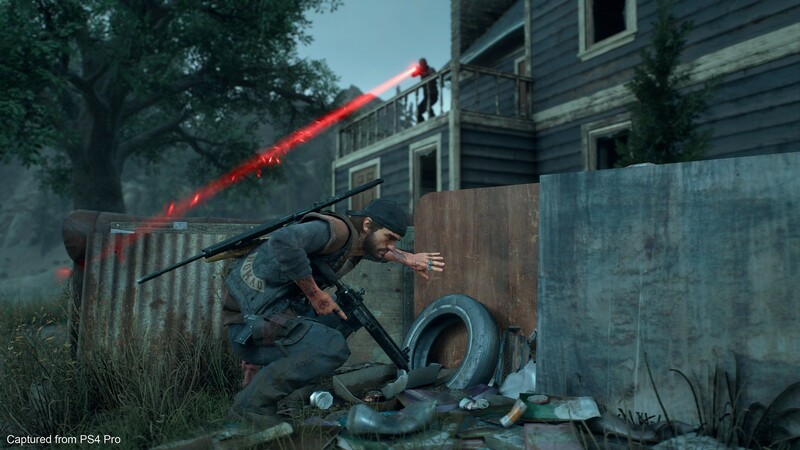 Bullet penetration takes on life-or-death importance in Days Gone, letting you blast through Freaker ranks without burning through all your ammo. Don’t kill time. You know the routine, honed over countless open-world games. You clean out an enemy outpost, then slowly tour the carnage, picking up every spare bullet, bandage, and crafting item that isn’t bolted down. In Days Gone, this approach can end in tragedy thanks to a roving Freaker swarms, infected wolves, or “Rager” bears. Be ready to grab whatever’s handy, and make a clean getaway at the first sign of trouble. CQC basics. Melee scraps in Days Gone feel desperate and wild-eyed, with blows carrying real weight. You tap R2 to land knife slashes and axe swings on nearby melee combatants; Deacon auto-targets nearby foes, but you’ll need to press R1 to roll-dodge past incoming attacks. Throughout it all, you’ll need to monitor Deacon’s stamina bar. The care and fueling of bikes. Bike reality #1: You’ll need to keep it gassed up. Duh. In a pinch, you can usually find gas cans around houses and buildings, or inside marauder camps. Of course, it’ll pay to upgrade your gas tank ASAP. Bike reality #2: your bike isn’t invincible; bang it up enough and it’ll stall out, forcing an emergency field repair. Drive safe, people! Let’s get physical. Speaking of bikes, Days Gone isn’t trying to be an offroad motorbike simulator, but you’ll want to master its physics system so you can get the hell out of Dodge when the Freaker hordes descend. Rule #1: When making a jump, try to keep your bike parallel to the ground to minimize damage. Hunting and gathering. You can hunt for food — deer, wolf, and more — then trade the meat in at encampments to earn credits and trust. You’ll want to build trust at encampments to unlock more potent upgrades for your bike and weapons. Touching interface. You can access all critical menus (map, skills, Storylines, etc.) by swiping the touchpad across the four cardinal directions. It’s a futuristic touch, and one I’d love to see other games adopt. Another immersive touch: emergency radio transmissions broadcast via DualShock 4’s internal speaker. Skills and experience. Advance Storylines and drop enough enemies, and you’ll gain skill points that you can invest across three skill trees: ranged combat, melee combat, and survival. I became a more formidable fighter with skills that let me quickly execute enemies after breaking free from grapples, repairing damaged melee weapons, and gaining damage boosts. That’s just small sample — the skill trees looked pretty beefy. It’s clear Bend Studio has been hard at work on the presentation, too. Days Gone shows off meticulously detailed rustic environments on PS4 Pro, complete with lush foliage, crumbling bluffs, and dust-choked roads. Look closely, and you’ll even see the individual pine needles that carpet many outdoor locations. Bend Studio has leaned into the unpredictable threats and encounters that honeycomb this menacing open world. A powerful weapon, a fast bike, and a stock of supplies will only get you so far — you need to expect the unexpected if you want to survive when Days Gone hits PS4 on April 26.